They say there’s a beer festival every weekend in San Diego County, but this May marks an unprecedented saturation of craft-brewing events. There will be at least one every day. Read more about that and some standout happenings below, then switch over to our events page for a listing of the many other opportunities to drink in the local beer culture this month. May 6 | Rhythm & Brews Festival: This year, the San Diego Brewers Guild is taking its premier annual spring beer-and-music festival to new levels, inviting the Grammy-nominated home-towners from P.O.D. to headline after performances by Ashley Hollander and The Tighten Ups. Their musical stylings will accompany a sudsy symphony more than 100 brews strong. | Historic Vista Village; South Citrus Avenue and East Broadway; Vista; VIP: 12 p.m., General Admission: 1 p.m.
May 5 | 1347 IPA Release Party: If you’ve been wanting to get a look at Oceanside’s work-in-progress Black Plague Brewing, this is your chance. A sneak peek will be granted to all who attend this ticketed event, complete with pints of the first brew—a hazy IPA named for the year the Black Plague swept through Europe—plus food, a pint glass and entry into a raffle. Sick! 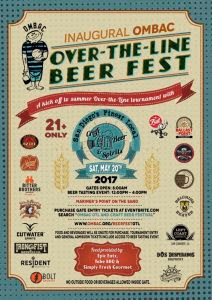 | Black Plague Brewing, 2550 Jason Court, Oceanside, 6 p.m.
May 20 | Over the Line Beer Fest: The Old Mission Beach Athletic Club has hosted its famous (and infamous) over the line tournament since 1954. In recent years, participants have urged OMBAC to bring in craft beer. This spring tourney answers all that popular demand. Trade in OMTOKENS for local brews to enjoy in tandem with heroics from crazily named ale-thletes. | Mariners Point, Times Vary. May 20 | Festival of Arts in North Park: Live music and a block where craftspeople will be creating works of art spanning various mediums are highlights of this fest, as is a dual-session beer-festival sponsored by Waypoint Public that will take up its own “Craft Beer Block” and will offer unlimited tasters of beers from more than 30 craft breweries as well as a karaoke stage. | North Park; Session A: 12 p.m.; Session B: 5 p.m.
May 21 | Cellar 3 Anniversary: It’s been two years since Green Flash Brewing Company opened its barrel-stocked brewing outpost. That’s enough time to brew up scads of tart, booze-infused beers, the rarer of that bunch will be served up at this celebration, which will also include a Q&A with barrelmaster Pat Korn, a cask tapping and music from The Barnacles. | 12260 Crosthwaite Circle, Poway, VIP: 11 a.m.; General Admission: 12 p.m.